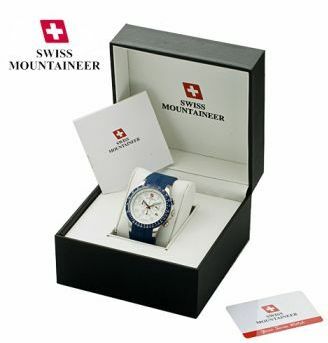 For a truly unique sports wrist watch that can not only handle an active lifestyle but also look great throughout, the Swiss Mountaineer SM1344 is the perfect watch. This Swiss made chronograph designer watch couples a blue rubber strap with a solid stainless steel case and buckle for a timepiece that is just as sporty on the outside as it is on the inside. The Army precision of Swiss movement will keep the watch accurate no matter how active you get and the watch is water resistant up to 100 meters for whenever the wearer gets caught in the elements. No matter what your sport or if you just want the look of the athletic lifestyle this watch will fit your needs.